Our variable may truly be absent of a value, and therefore its “value” is $null, an Automatic Variable in PowerShell which can “represent an absent or undefined value in commands and scripts.” This could apply to any variable that we declare but for which we do not set a value. If our variable is a string, it could contain a value of “”, which is an empty value as far as a string is concerned, but is still a value when compared to $null. Let’s look at how to test for these conditions. Let’s open a fresh ISE session. Using the following code, we are declaring a variable $DemoString but not assigning it a value. We then immediately test it to see if it is $null. This fails because even though the empty string value doesn’t seem like a true value, it is in fact a legitimate string type value. If the value is a string, you can use a static string function to check if the value is $null or an empty string at the same time. You can use this often when you know the value type should be a string. Now let’s look at how you might use this knowledge when scripting. We now know there are two distinct conditions that we need to potentially test for before attempting an operation on a variable. In this example, we are going to use Get-CimInstance to return information about a specified Windows service. In this particular case, we are checking whether or not the variable holds an object. In the first command, we get WinRM, a valid service. In the second command we attempt to get FakeService, which doesn’t exist. You can see that $Service is NOT $null in the first command, but IS $null in the second command. Straightforward. What if I initialize the $b variable, but I do so with an empty string? This time, our empty string comes back and says that it is not null, nor is it empty. It contains a blank space. What if we remove that space? It seems that removing the space caused it to be null or empty. A collection allow you use an index to access values. If you try to index into a collect that is actually null, then you will get this error: Cannot index into a null array. If you have a collection but try to access an element that is not in the collection then you will get a $null result. If you try to access a property on a $null value, that the property will also be $null. The count property is the exception to this rule. When you have a $null value, then the count will be 0. 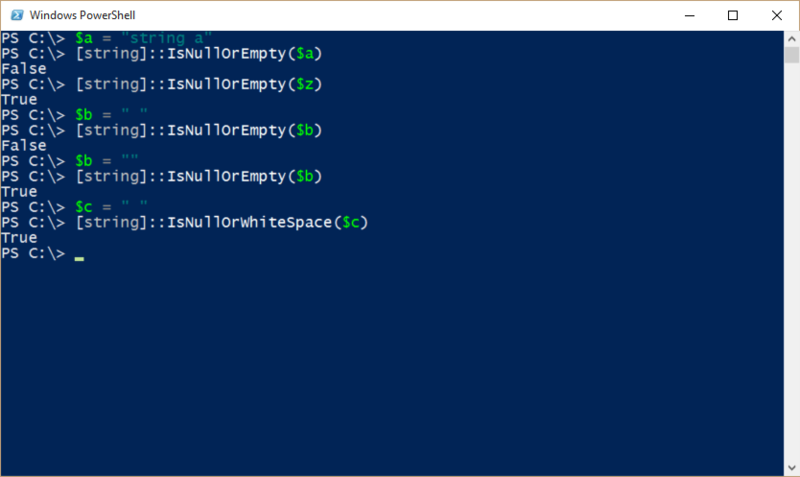 This special property is added by PowerShell. When a $null value is used in a numeric equation then your results will be invalid if they don’t give an error. Sometimes the $null will evaluate to 0 and other times it will make the whole result $null. Here is an example with multiplication that gives 0 or $null depending on the order of the values.